Want to see quick results for brand visibility, on an affordable budget? Then opt for our service page PPV marketing. You’ll be landing on the front pages of the main search engines in next to no time. 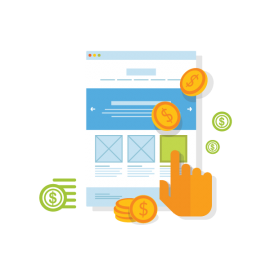 Since the main edge of PPC marketing is its cost effectiveness, we always make sure that our clients only pay for campaigns and services that they actually need. Those needs are always correlated with their budgets and goals. Good Pay Per Click campaigns need two ingredients: an understanding of the customer’s market, industry, and niche, as well as their needs and constraints. We, at Paper Frog Media, can provide you with a comprehensive PPC strategy, which comprises one or several of the following: Video Ads, Search Ads, Display Banners, Social Media Ads, and Pay-per-click Remarketing. Our strategy for articulating PPC campaigns is intuitive enough. First, we discuss business goals and desired ROIs with our clients. Then, we analyze their market and agree on a budget. Finally, we deliver a pay per click strategy that presents them with several alternatives and suggestions for the types of ads that they stand to benefit from the most. There’s no simpler way to turn up at the forefront of the world’s biggest search engines, like Google, Yahoo, Bing, and Yandex. Paid Search Engine Ads are all about proper targeting and simple, yet engaging calls to action. Our copywriters can provide you with just that! How do you know your brand is in need of some PPC remarketing? It’s simple: when you’re missing out on important leads, which are not turning into sales and profits. We can help you regain the trust and attention of those formerly engaged users, with comprehensive, tailored PPC ads. Your social media presence can be greatly improved with a series of thoughtful, well-targeted ads or sponsored posts. The best part about Twitter, YouTube, or Facebook ads creation and promotion is that their success is easy to analyze. We take extra special care to check off all the major KPIs and fulfill your sales targets. Whether you’re on the market for well-designed ad banners or video ads, our team of visual wizzes will ensure the biggest bang for your buck. We are skilled in and experienced at creating both types of ads, whether for rebranding purposes or for increasing brand awareness and visibility. Both banners and video ads are created in-house, by a staff of seasoned professionals. Daily campaign management and bid price monitoring services are included in our offer because we, much like our clients, are after the best return on investment we can obtain.